As markets continue to grapple with the uncertainties of geopolitical events across the globe, Miton multi asset fund managers David Jane and Anthony Rayner will give their insights, thoughts and positioning in this webinar. In this webinar, fund manager Nick Greenwood and closed-ended fund analyst Charlotte Cuthbertson will discuss how they look for pricing opportunities in the investment trust world, and the factors that they look for to identify these opportunities. In this webinar, Gervais Williams, co-manager of the LF Miton UK Multi Cap Income Fund, will provide an update on the fund and its positioning as well as giving his thoughts on the market more generally. In this webinar, Thomas Brown and Carlos Moreno, fund managers of the LF Miton European Opportunities Fund, will look at the attraction of quality, growth stocks in Europe while discussing their outlook and positioning for the fund. In this webinar, Jim Wright, fund manager on the LF Miton Global Infrastructure Income Fund, discusses the characteristics of infrastructure assets and how they can be used effectively to generate a growing and sustainable income, as well as highlighting the asset class' defensive characteristics as shown in the recent market pull-back. 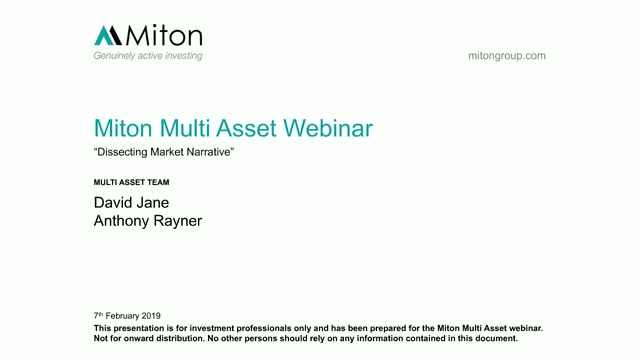 With the recent pull-back in financial markets, Miton multi asset fund managers David Jane and Anthony Rayner will discuss their views and positioning, as well as their outlook for 2019 in this webinar. In this webinar, Gervais Williams, fund manager on the LF Miton UK Smaller Companies Fund, sets out his views on the UK Smaller Companies universe, whilst also discussing his outlook and positioning for the fund. In this webinar, Carlos Moreno, fund manager on the LF Miton European Opportunities Fund, sets out his views on European markets whilst also discussing his outlook and positioning for the fund as it approaches its three year anniversary. In this webinar, Jim Wright, fund manager on the LF Miton Global Infrastructure Income Fund, discusses the characteristics of infrastructure assets and how they can be used effectively to generate income. In this webinar, Hugh Grieves, fund manager on the LF Miton US Opportunities Fund, sets out his views on the longest post-war expansion in modern times whilst also discussing his outlook for US markets. Despite the headlines, in this webinar, Eric Moore, fund manager on the FP Miton Income Fund, sets out why there are reasons to be optimistic about returns from UK equities, looking through the prism of the market's income generating characteristics. With current uncertainty in financial markets, Miton Multi Asset fund managers David Jane and Anthony Rayner will discuss their views surrounding current topics in this forthcoming webinar.